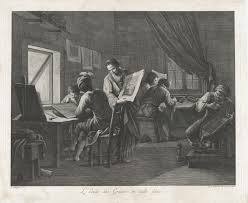 Printmaking originated in China after paper was invented (about A.D. 105). Relief printing first flourished in Europe in the 15th century , when the process of paper making was imported from the East. Since that time , relief printing has been augmented by the various techniques described earlier, and print making has continued to be practiced as one of the fine arts. Line art is any image that consists of distinct straight and curved lines placed against a (usually plain) background , without gradations in shade (darkness) or hue (color) to represent two-dimensional or three-dimensional object. 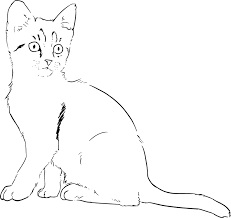 Line art is usually monochromatic, although lines may be of different colors. Etching is an intaglio method of print making in which the image is incised into the surface of a metal plate using an acid. The acid eat metal, leaving behind roughened areas, or, if the surface exposed to the acid is very thin, burning a line into the plate. The process is believed to have been invented by Daniel Hopfer (circa 1470-1536) of Augsburg, Germany, who decorated armour is this way, and applied the method to printmaking.